31 Aug Why no spare? So this is a big bug bear of ours as to why manufacturers don’t supply cars with spare wheels anymore. Yes there’s Co2 emissions, and yes there are runflats but neither of these matter when you’re miles away from home and get a split / slash in your sidewall. The first most people know about not having a spare wheel is when they pop open the boot and see a shape the size for a spare wheel in the boot floor, but no wheel actually there. Not even a spacesaver! Now that’s just teasing, why put the space there but not a wheel! The can of ‘gunk’ that should be in your boot may work fine if you get a ‘regular puncture’ but slash your sidewall and you’re knackered. Our advice is if you are driving long distances, and especially about to embark on a European Roadtrip, is to get yourself a spare wheel and tyre if you can. 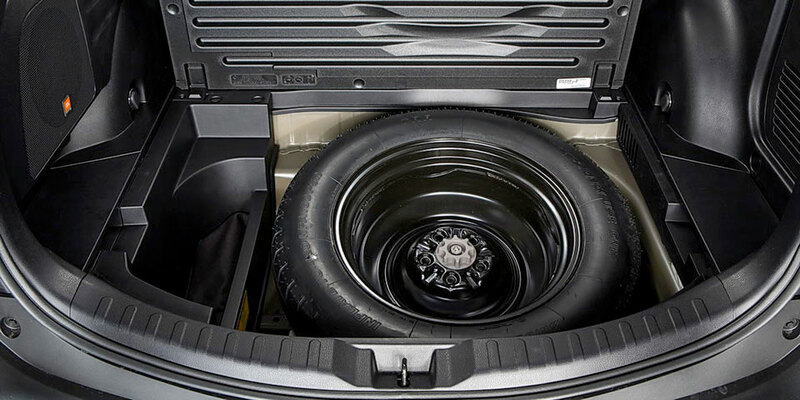 If you can’t fit a full size wheel in the boot (and let’s be honest with a lot of performance cars running 19″ and 20″ wheels these days it may well be a squeeze – but there’s always the back seat if you have one, that can be used on a roadtrip) then the next best thing is a spacesaver wheel and tyre. Don’t forget you’ll need a jack and wheel brace too. And make sure you know where your locking wheel nut key is. Another option is to have a good breakdown recovery service and taking a spare full size tyre with you (you can always drop a bag in the middle of a tyre to make use of the space available). The recovery company can take you to a local tyre fitter and you could be on your way again within a matter of hours, rather than waiting a couple of days for a tyre to fit your car. We also recommend throwing in a couple of cans of tyre gunk too just for good measure and peace of mind. And of course you should also check that the tyres you have on your car are in a good condition. If you have any doubts we recommend fitting new tyres. They could be the difference between having a miserable time stuck for days in a small town waiting for a new tyre, or an epic time blasting round some amazing roaads on your roadtrip.